Pocket diapers that consists of a water proof outer layer, a stay dry inner layer and a pocket opening in which to insert a soaker. The absorbent part of a pocket diaper is called an insert - it is a long rectangular piece of absorbent material, usually microfiber. The insert is put into the pocket before wear and taken out before being washed. The outer water proof layer of the pocket acts like a built in diaper cover. It is usually made of PUL or polyurethane laminated fabric. Some pocket diapers with prints are made with a poly/cotton blend and have a tendency to wick, so be careful. The stay dry inner is usually made with microfiber or suede cloth. These are very soft to the touch, but are able to keep wetness inside the diaper so your baby's skin is totally dry. Some babies do have allergies to suede cloth though, so of you have persistent redness or rashes with suede cloth it could be the reason. Many pocket diapers come with an insert, or you can use a prefold, flat or microfiber towel if you prefer. Some moms don't like to use microfiber inserts because they can develop odors over time. If you use a little bleach on your microfiber inserts every few months you can keep any odor problems at bay. You can also purchase hemp or bamboo inserts, but they are quite a bit more. Pockets are almost as easy as it gets. 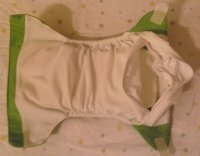 You simply put the insert or "stuff" into the pocket opening and then put the diaper on your babe. If you stuff your pocket right out of the dryer, then it will be ready to use when you need it. Once the diaper is ready to be changed you take it off and remove the soiled insert. You do not use the pocket again until it has been washed. One of my favorite things about pockets is their absorbency. You can add as little or as much as you need. If you have a heavy wetter, or need to use one for extended periods of time, then you can add an insert and a doubler. If you have a light wetter you can use a smaller insert for a nice trim fit. Pockets are a great choice for naps/nights, going out of the house, long trips and day care. They are so easy to use that you can easily leave them with daddy or grandma for the day without worrying about them knowing how to use them. I have pockets in my stash for going out and about and night time. When I'm out and need to change one of my babies I love the ease of pockets. And because of the water proof out layer, you can just wrap them up and velcro or snap them closed so the mess stays inside. I have seen many moms ask about using pocket diapers in the hotter summer months. I have found that with all the man-made materials used for pockets and the very warm weather where I live (high 90's, low 100's) that my sons get very sweaty underneath the diaper when playing outside. If you live somewhere very hot, you might want to consider having some fitteds or prefolds on hand for playing outside in during the summer. There are some pockets that have natural materials, but not many. A few are the Tots Bots Easy Fit which has a bamboo inner and the Babykicks Bumboo which has a bamboo fleece lining and a hemp insert. Very nice, trim diapers! Most pockets have the pocket opening in the back of the diaper near the waist, but some do have the pocket opening in the front. Katydid is one of the more popular brands right now that has this unique feature. It is easier to shake out a soiled insert from the front opening than the back and if you pull a soiled insert out, you never have to worry about touching poop. I have found that the front opening is bigger which makes it easier for stuffing. After using both styles, I don't think one is really better than the other. 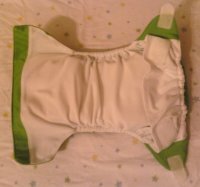 A new product on the market are the "sleeve" diapers, such as Smarti Pants and the Thirsties Duo Diaper. A sleeve diaper is like a pocket diaper with openings in both the front and the back. The reason for both openings is so that you don't have to bother with removing the soiled inserts. You just throw it into the wash and the insert agitates out. Nice idea, huh? So does this really work? Well I haven't tried one yet, but in my research I have found that they do. So if you like the idea of a pocket diaper, but don't want to deal with removing a wet, poopy insert, these would be perfect. Not only are pocket diapers absorbent and easy, they are super cute! You can literally find a rainbow of colors for your pockets. If you are anything like me, you can have a stash of every color pocket you like (which is a lot!). Some pockets even come in prints, just be careful the outer is 100% PUL so it doesn't leak. I started off using pockets when I first began to use cloth, and they made it so easy and fun. I always recommend pockets to anyone who is considering using cloth because I think they are a great "gateway" diaper (for me it was the bumGenius One Size pocket diapers). And if you use one size pocket diapers, you are getting a great value for your money. 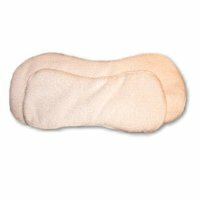 There are many great pockets to try, so if you are looking for great absorbency and ease of use I would try one.